The art of gifting flowers extends back to hundreds of years ago. Flowers were given as a way to communicate and tell stories and many believed that flowers had a special meaning. The Victorian culture is known for giving significance to the different types of flowers and turning flowers into a way to express emotion. Flowers were given as gifts and sent as a message, eliminating the need for words. 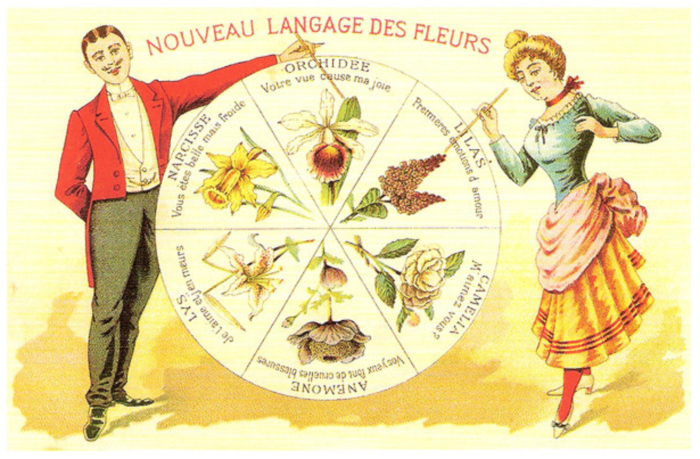 During the Victorian era the language of flowers was just as an important as being well-dressed. The scent of a particular flower could send a unique message and flowers adorned everything — clothing, hair, jewelry, home decor, china, stationery, and more. Bouquets of flowers also gained popularity and were well-liked as gifts. Sending small bouquets of flowers wrapped in lace and tied with satin with a secret message became a popular pastime. Flowers can convey different messages depending on which ones are given, how they are given, how they are held, and even how they are grouped together. For example, flowers presented in an upright position represent positive thoughts, whereas the opposite direction can have a negative meaning. A person can also say “yes” by offering flowers with the right hand, or “no” with the left hand. This language of flowers is called Floriography. So you may be wondering which flowers to send to say “I admire you”, “I’m sorry”, or “Congratulations”. The list of flowers in the world may be infinite, but here are some of the most popular flowers and their meanings so you can choose the best flowers to send for any occasion. Flowers are the perfect way to relay a message or show your gratitude, love or affection for someone special. With Zinnia, send a beautiful bouquet of flowers anywhere in Omaha with same or next day delivery starting at only $35. Sign up for the Zinnia newsletter and receive $5 off your next order!